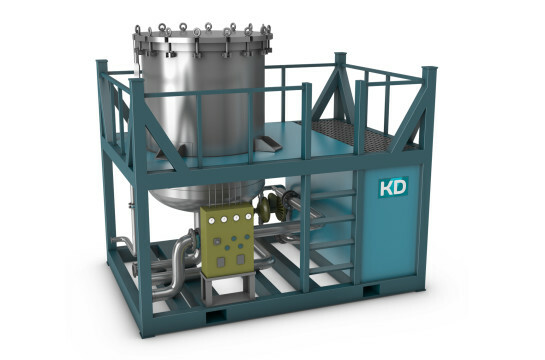 KD’s advanced sludge removal system performed a very useful function in oil & gas field for removing solids from fluids without using energy or using rotating parts. Due to the unique design large sludge particles would settle and could be removed from the process fluid by a dedicated drain system. The bottom of the system should be sloped to facilitate optimal functioning and self cleaning. The advanced sludge removal system should not be agitated and should overflow into the next compartment. 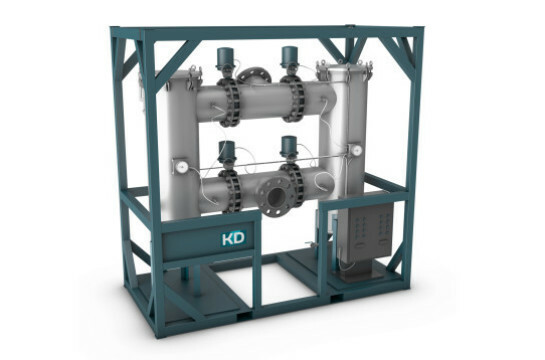 The system can be easily installed inline with other KD treatment systems. The SERIES FS600 filtration skids are designed to filter particulate from liquids. The dual vessel cartridge filter units are designed to be a portable complete filtration system and can be easily into service with little more than upstream and downstream connections being made. The filtration skid is designed and build to process specifics for the required flows and micron retain age. By Maintaining absolute fluid cleanliness, end- users can dramatically increase the life of critical wear components on rotational equipment, minimizing downtime and maximizing profitability. The filtration skids are offshore proof and equipped with all necessay valves, safety features and allows operators to simultaneously filter with one vessel and change out cartridges in the other vessel. All according to the latest design codes. 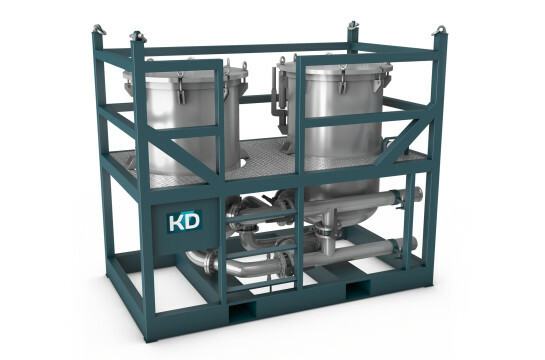 KD is specialized in the design and fabrication of self-cleaning filtration skids. The filter element is an automatic strainer made of wire (V-shaped profile) welded on support pins; the space between the wire determines the micron rating. Continuous cleaning is carried out either by external scraping (the strainer is rotating and the vertical scrapers are fixed) or by internal brushing (the strainer is fixed and the helical brush is rotating). Impurities are directed toward the bottom of the filter and are removed through regular draining with manual or automatic valve. 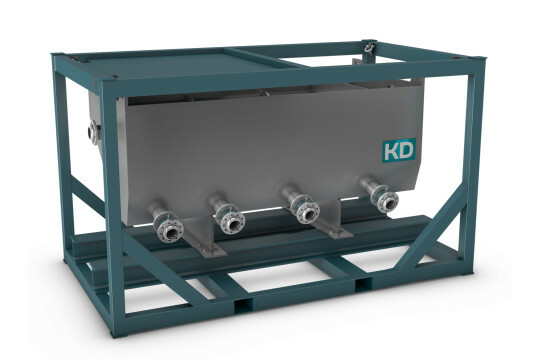 KD series SCF1000 ATEX, automatic strainer allows filtration of low to medium viscosity fluids and is ideal to filter a wide variety of products for applications in petrochemicals and oil & gas industry. 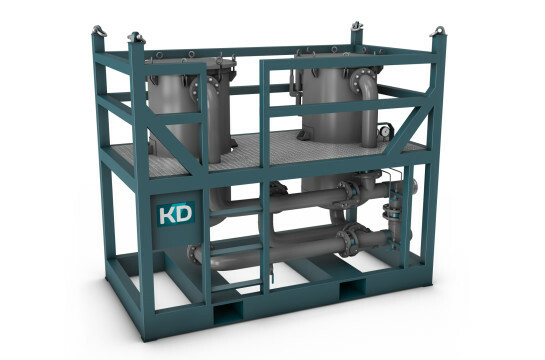 KD’s Vertical Pressure Leaf Filter Unit is designed and equiped with a DE mixing tank and pneumatic control system to perform an effective filtration job. 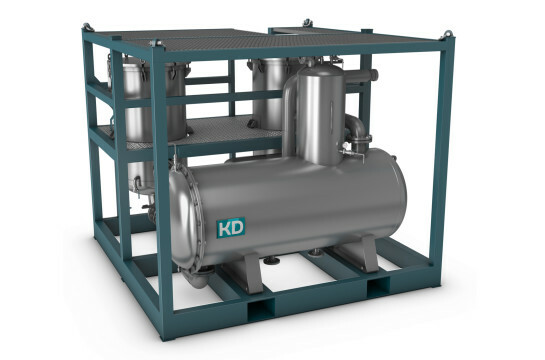 The KD’s pressure leaf filters are special designed with washing arrangement for washing the cake of the filter and extra large filtration area. This makes it possible to filter fluids with high dirt loads even at high flow rates. For slurry discharge the series VPLF is provided with a sluice header which is driven by a Pneumatic Actuator. The sluice header is equipped with flat water spray nozzle at 3.5 bar fresh water pressure. Cleaning the filter leaves can be done without opening the filter vessel.